Albania's two main political parties have both claimed victory in elections seen as a crucial test of the country's progress towards joining the EU. Voting on Sunday was marred by an exchange of gunfire that killed an opposition activist and wounded a candidate from the governing party. 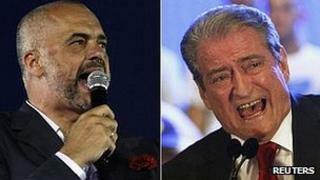 PM Sali Berisha is seeking a third term but faces a strong challenge from opposition leader Edi Rama. Campaigning, often acrimonious, was marked by allegations of vote-rigging. A dispute over the country's electoral commission also threatens to leave the result in doubt. Elections in Albania, one of Europe's poorest countries, have been marred by violence or claims of fraud since the fall of communism there two decades ago. After polls closed Mr Berisha told reporters in his Democratic party headquarters that he was "convinced of our great victory." However, Mr Rama insisted "the Renaissance has won", referring to his left-wing coalition. Mr Berisha and Mr Rama both promise job creation, economic development and tax reform. They are also both strongly pro-European, reflecting widespread public support for EU integration. Analysts say the biggest question mark is likely to hang over the Central Electoral Commission. Because of a dispute between Mr Berisha's coalition and that of Mr Rama, the seven-member commission has only four members. The minimum legal requirement is five. On Saturday, a Western diplomat told AFP news agency that there was now "a great risk the results [of Sunday's polls] would be contested, either by the outgoing coalition or by the opposition". Sunday's shootout took place near a polling station in the north-western city of Lac. A police spokesman said an activist from Mr Rama's party, Gjon Gjoni, was killed in an exchange of fire with Mhill Fufi, a candidate for the governing party. Mr Fufi was seriously wounded and is reportedly being treated at a hospital in Tirana. More than 6,900 candidates from 66 political parties contested 140 parliamentary seats. Overseeing the polls were about 400 international observers and more than 8,000 Albanian monitors. The EU, which has twice rejected Tirana's membership application, said Sunday's election "represents a crucial test for the country's democratic institutions and its progress towards the European Union". On the eve of the vote, President Bujar Nishani urged voters to have "Albania and its future" uppermost in their minds. "[We] should properly consider the importance tomorrow's vote has for our ties with the world, with which our freedom, prosperity, fate of the present and the future are closely linked," he said.